This is College Physics Answers with Shaun Dychko. Percent uncertainty in a measurement is the uncertainty, or sometimes called the absolute uncertainty, divided by the measurement itself. So this numerator here, this absolute uncertainty is the amount by which you would expect repeated measurements of the same thing to vary. So in this case we're told that it varies by 3 percent for the bathroom scale, but we want to know by how many kilograms does it vary between measurements. And we're going to do a bit of algebra. First we'll switch the sides around, and so we delta A over A equals percent uncertainty. And then we'll multiply both sides by the denominator in order to isolate delta A. So multiply by sides by A. Leaving us with this line here. 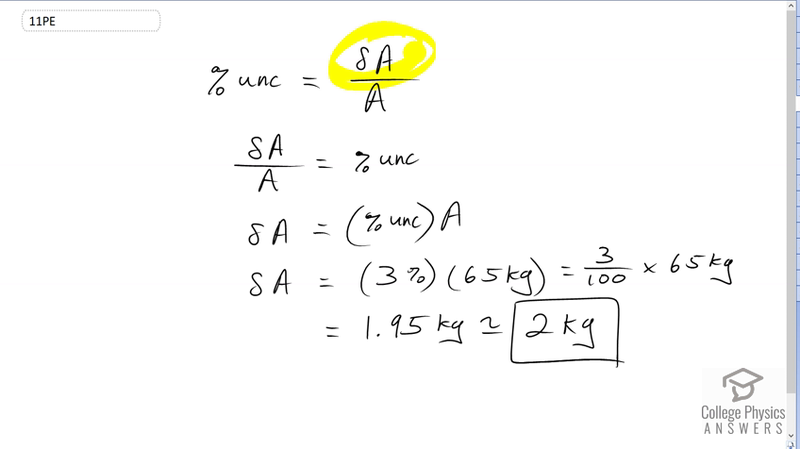 And so we have the uncertainty equals the percent uncertainty times the measurement, and this case the bathroom scale measurement of 65 kilograms has a percent uncertainty of 3 percent. And 3 percent can be written as 3 over 100, every percent can be written as the number divided by 100. And if you know French it makes sense because cent is the French word cent, which means one hundred, and per cent is per one hundred. Times 65 kilograms works out to 2 kilograms. And an uncertainty typically only has one significant figure, and so we have 2 kilograms here.